This section will contain great games played by our members. It promises to be short. Probably White's most uncompromising line against the classical KID and, hey, its fashionable too! 9...c6 10.Ba3 cxd5?! 11.cxd5 a6 12.b5! Against any other reply Black could play 12...b5, when White's B on a3 is misplaced, so White must make this temporary pawn sac. As far as I can tell this is new. 13...Qb6 was played in Greenfeld-Birnboim, Jerusalem 1966, but after 14.Bxb5 Rd8 15.Nxe5 Black conceded by move 25. As Black cannot defend the b5 pawn anyway 13...Qb6 looks dubious. With 13....Bh6 Black takes control of some important squares but White's reply begs the question as to whether Black should have tried 13...Bg4 first. 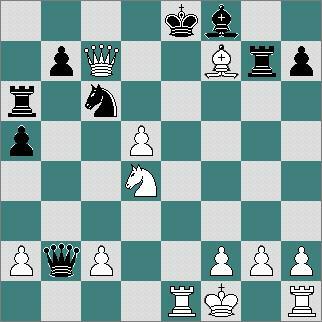 Not a pretty move, but after 18...f5 Blacks position is no oil painting either after 19.exf5 Bxf5 20.Ba5. The N is going to c4 to attack d6 and also allows the Q to get over to g3 to defend/attack on the K side. 23.Bxf8 is also very strong. OK, he eliminates the B but now a N will quickly arrive on f5, putting paid to any Black hopes on the K side. The rest, as they say, is technique. Send us your best/favourite game for display on this page.